Sometimes even knowing the genre will not be of much help to you. Candy Crush Saga is a game pertaining to the genre of match 3 games but having the hands on approach of other match 3 games wouldn't be much help for you to play this game. This game is entirely different from other match 3 games like Bejeweled Blitz or collapse where the jewels or building parts as is the item respectively would be falling and you have to make pairs of three. 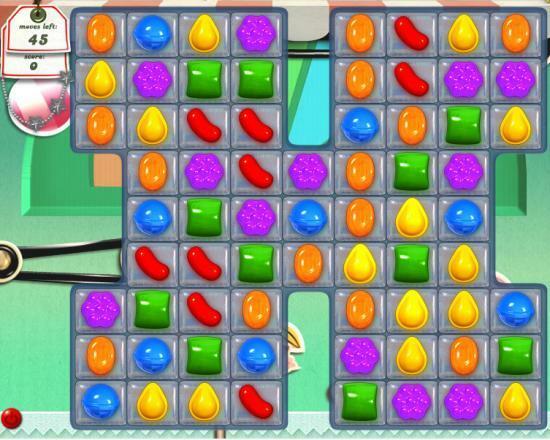 Instead in candy crush saga, you are provided with fixed board with a lot of candies of varied shapes are provided and you are required to solve the puzzling objectives to get the points. So you see it's more of a thinking man's game. Now let us peek into the insights of the game. In Candy Crush you are provided with a fixed board and you are required to achieve the objectives you are given by arranging the candies and thereby you proceed to the next level if you successfully complete one level and achieve the puzzling objective. Level by level you have to proceed in the game till you reach the sixty fifth level as only sixty five levels are provided at the launch. Initially, you would be asked to reach up to some particular scores in a specified number of moves. But as you proceed you can actually feel the heat of the game. 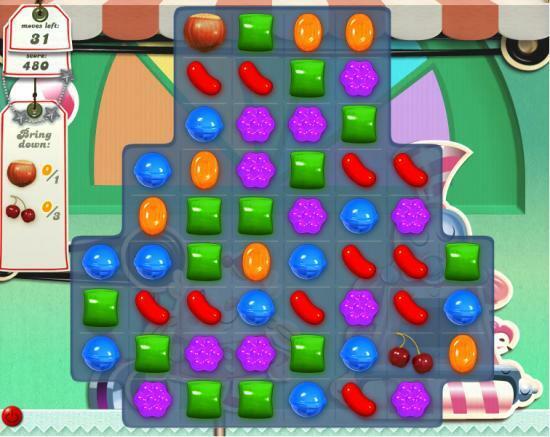 As you would be able to see in some of the levels that you would be provided with some ingredients among the candies and you would be required to lower the ingredients to the bottom of the board, this should be done really carefully and safely as it will take your life if it gets destroyed. In some levels of Candy Crush you would be getting some spaces having jelly in them instead of candies and you would be required to get rid of it's gumminess before you proceed in the game. But in addition to this what creates the real headache is the fact that you have to complete each level in a specified number of moves which makes your number of moves restricted. So in candy crush rather than doing random moves, you are required to perform the right moves which will help you to get the actual result. Another aspect of gaming in Candy Crush that has to be dealt here its addictiveness; it is really an addictive game where you are actually glued to the game of the next best possible move. One of the greatest aspects of this game is that you are not disturbed for money every now and then as is the case in most of the Facebook games. In the game each player is provided with five lives and when you lose one board you only lose one life. So the point is even if you lose five times in a row you would be spending around a 15- 20 minutes in the entire process so it can prove to be a great pastime. Once you have lost all your lives, it takes some thirty minutes to regain each life. So if you don't want to play the whole game in one sitting, then it can be great game for you. Obviously continuing the Facebook culture what is the point if you are allowed to play the whole game in one sitting so you are provided a break of thirty minutes so that you can continue your game after every thirty minutes. In the game of Candy Crush you are also provided with energy ups which will be actually initiated and accumulated during the course of the game making it a really great option. So on the whole, King.com has actually put in a great effort to remove the line that differentiates the normal games and the Facebook games with its latest addition Candy Crush Saga. After the titles like Bubble Witch Saga, this is a great addition to the titles of King.com. It will keep you glued and make you go gooey with excitement as it is a really addictive magnum opus. Read the walkthrough review of the action game Jagged Alliance: Back in Action and know the pros and cons of this game. Know what all is interesting in this game and how to play this game. Read the tips and tricks to play this game and a lot more about Jagged Alliance: Back in Action game. I have been on the same Level (35) for two weeks now, and I play night and day. How could this be. The game is not fun anymore. In inventing this game, I don't understand how you can make a game so hard and difficult for a person to get out of each level. I can understand a few days but two weeks. I also understand that there are other people who have been on the same level for over a month. To me this is not worth it. I am actually getting sick playing. And I have followed the directions and tricks on how to play and still nothing. I think this is very unfair. I will not be playing anymore!!!!!! How do you get tickets in this game? I have been on the same level for a week now, the one that is a timed level. You need to get 40,000 points in 60 sec. It is impossible to get 40,000 points when you can't move until the candt stops dropping. Its waist time. Even if I am on the opposite side of the falling candy it won't let me move again until all the candy stops moving. Does anybody know how to get past this problem? i have been playing level 19 for the pass 3 days and can't seem to get pass there it is getting really bothersome. I agree. I have been stuck on one level for 4 days and it makes me not want to continue to try, as it seems almost impossible. GET RID OF THE JELLIES PLEASE HELP i CANT SEEM TO FIND OR UNDERSTAND, someone please tell me which is the JELLIES? OR THE INGREDIENTS? I have been stuck on #20 and I win but never move forward. What do I do? How do I get ticket to contue? I did not play all the levels but after so many messages I started playing it again in the hope to help you. So here is the status- I have stopped playing it again because just like you guys I have also got stuck! How do you send gifts in candy crush? I started again as my friends requested and the same thing again so now i am crushed by Candy and don't want any more... So no shopping for me at the CAndy Store..
How do you obtain the lives sent to you by friends? When I have 5 and am asked to accept the gifts, it will not add to them and if I go back they are gone. What's the point in them? Where do the lives go when friends give them? I don't notice my five lives increase or refill after I go through them. For example, I was given nine lives by friends. I played through my five lives but when those were gone, they weren't replenished with the lives given to me. What am I missing? I use to get a daily gift box in the corner of the screen and I have not seen it so have not received my daily gift since December. I also am accepting the extra life from friends but am not receiving them. I JUST finally finished level 35 after countless attempts over the last few days. It was driving me absolutely crazy. The only real tip I have is to focus on those 4 corner spots from the first move on. I would sometimes give up better moves if necessary, because those are what will trip you up every game. The other thing I finally realized - I could not win the game without acquiring numerous sprinkle candies. So, I started to focus on getting 5 in a row, instead of settling for 4 in a row. Again, I gave up other moves to make that happen. Once I really focused on making that happen, I won within just a few more tries. I keep receiving lives from friends but when I accept they do not show up for me to use. Anyone else having this problem and how do I get it fixed. How do you send lives to friends in this game? I receive them but how do I send them? Giving and sending lives is fake; you get 5 lives per half hour - that's it; I don't know anybody who is getting more lives. Some people are just plain better at playing. I got a friend hooked while I've been stuck on level 23 and she has buzzed right past me! iI extra lives tonight but not received them - where do they go? Getting lives is not a fake. Look in your messages. People CAN send them. However, don't add them/open them until you have used your existing ones and only keep 5 at a time up. Lives can be max 5 only, only if you are short of them will you be able to receive more. I finally got to 36 after 10 or more days on 35. How do I get let in to 36. My picture is there but it doesn't come up it went back to 31 and I had to work my way again. People have sent me on my request lives or tickets not sure. It let me use them all. It said 5 and full but I couldn't move to 36. Now all my lives in the heart are gone. Please tell me about tickets and how I can access 36. How do you send gifts? People send me gifts and I do not know how to send any back. As soon as i run out of lives the game asks me to buy more lives. This game has been designed to get players addicted on the early levels and then charge you to progress just like the other %99 of facebook games. Games like these are designed as pay to win and net companies like this millions in profits. Do yourself a favor and go and buy a game for a one time payment that you can play for the rest of your life free. Don't be conned by games that claim to be "free" because they clearly are not. I have cleared all the jelly on level 35 but still on level 35. Have received tickets from friends in hope to progress to level 36. Clicked on ticket but still on level 35 and ticket gone. How do I redeem tickets to get to level 36?? completed level 35 how do I get let in on level 36? Where do I find tournaments at? What do I need to do on level 130? Just started playing with no idea on how this game works. The first level I was able to move the candies easily by dragging them to make the match. After that it mentioned making T and L shaped matches but I can no longer drag the candies. How do I make the matches now? I am not stupid but a basic explanation of how it works would have been helpful. Attempts to pass certain levels! Over it. When my daughter plays on her I-pad or phone, she has a message folder. When she runs out of lives, she can access her messages and get the other lives. Why does Facebook not have a message folder for Candy Crush? Basically, I can only get a life if someone sends me one mid-game. I am quitting this game... I can't figure out how to get the lives my friends send me AND they are NOT getting the ones I send them. Is this a game you are playing to see how many we will send knowing it's a HOAX?? I have been stuck on level 70, for a few weeks now and cannot find a way out, it's very depressing and no fun at the moment. It's a game and should be fun to play, but some of the levels are ridiculously hard to finish, any ideas on how to win this game before the chocolate takes over me altogether. I love the game myself. I didn't understand how to get lives or board to the next level. You have to request tickets from the people who play the game or your friends on fb this is for tickets/lives as well. I am on board 78 and you just have to take your time and get the right combination of colors to set up,then you can unlock the board and score big points. My cousin taught me how to play the game. Someone stated this game does not ask for money all the time. well, it has been asking me all the time for money then when I buy credits. Do not know where they go. I cannot tell I bought credits. I think they are a rip off and I will not be playing any more.. When lives are given, do not accept them till you have lost your 5 lives. You can't bank the extra. I am up to 86. My daughter is at one hundred something. You do not have to buy anything. Ask friends for lives- it does not cost them a thing. If someone asks you for a life or help to go to next level, say yes. It takes concentration. You have to figure out how each level goes and some really need you to make big moves. I have been stuck for days and just keep trying during my free time. It is more challenging than bejeweled! I do not understand why you cannot store the lives you are sent by friends. What about the posts I get for 100 free lives? Where do they go? One of my friends did it the same time I did and she got hers but I didn't. What is the point of sending and receiving if you cant use the darn things? Why cant I open candy crush on my Kindle fire or my android phone? I am not sure about that. It is working fine on my Galaxy S Duos. I am stuck on 35. Several times said I passes to 36, but won't let me, goes back to 35 saying need 362600 target pints, so, if I don't get that many, I can't pass? So frustrated! Please tell me how to make the 'packet sweets'. I need to get 6 of them on level 135 if I get any its by accident. I finished 20 and need to go to 21 but am not able to. What do I do. can you get gold bars without paying for them? there should be some way to win or earn them. it seems without gold bars you can only go so far. Share it with us if you can do it! Is anyone familiar with the "tooth fairy" that appears to allow you to progress when stuck? When and at what point does she appear? She has shown twice after a considerable time at being locked on certain levels. My friend and I seem to be the only two players associated with the fairy. I have been stuck with 2 jellies left sometimes one jellies, it's driving me nuts. It's like it dosen't want you to go forward when you get to a certain spot. Having trouble with Candy Crush Saga 43. Need to get 50,000 points in one minute. Seems not possible. Any ideas how to get through it?